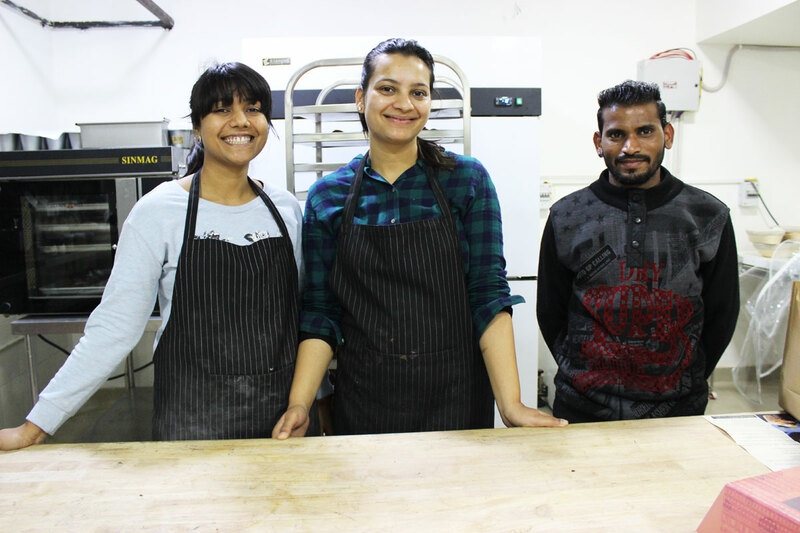 It’s 10am but the team at Suchali’s has been in the kitchen since 6:30am. 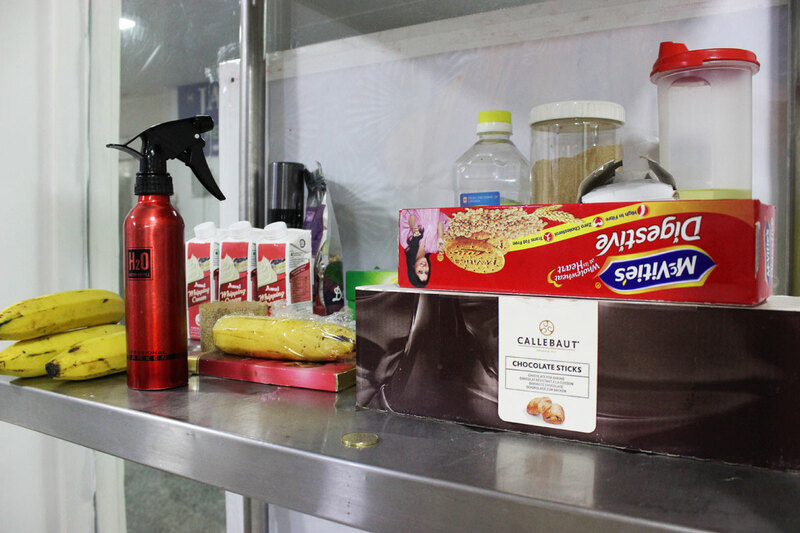 Orders being prepared according to delivery schedules. 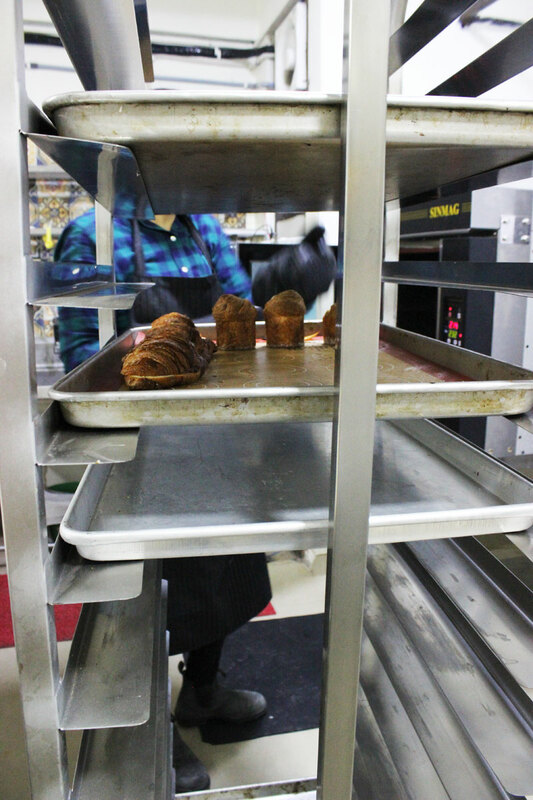 Croissant dough being put through the machine. 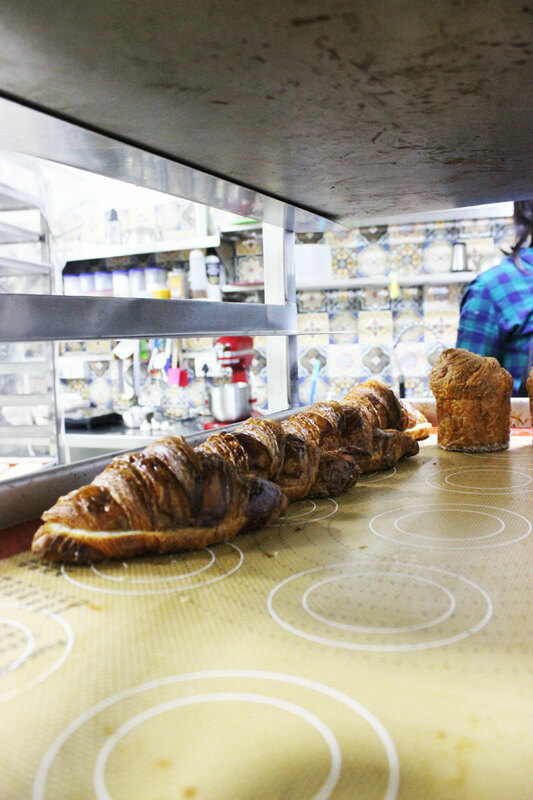 The machine creates fine layers in the dough which is what makes the croissant flaky and textured. This dough is left for its final rise before baking, known as proofing, for a day. 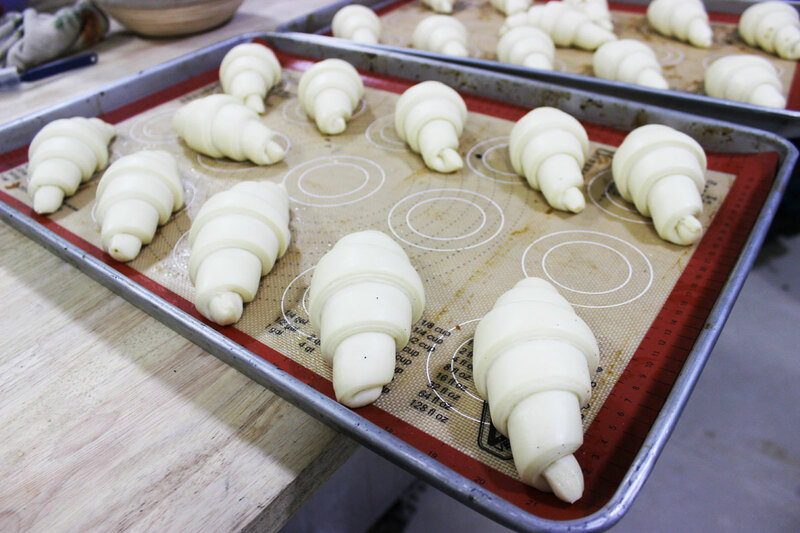 Yesterday’s batch of proofed croissants ready for the oven. 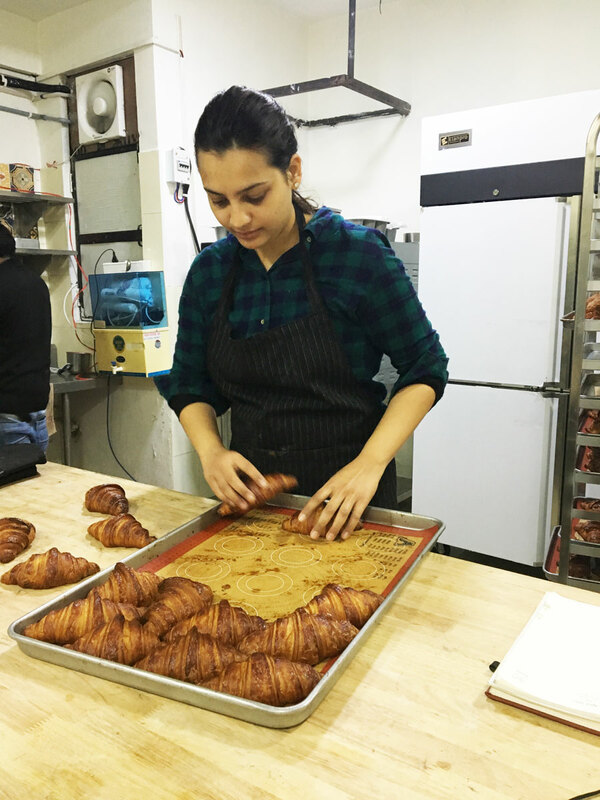 Suchali sorting the croissants out – some will be twice baked with filings and some will be left plain. Take a look at that colour! If you could only smell the kitchen at this stage. 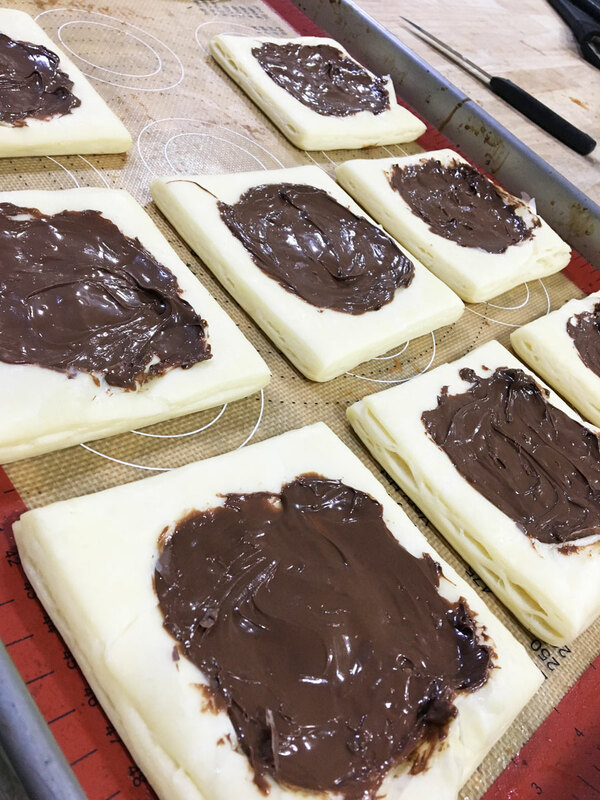 Twice baked almond croissants being brushed with vanilla syrup. 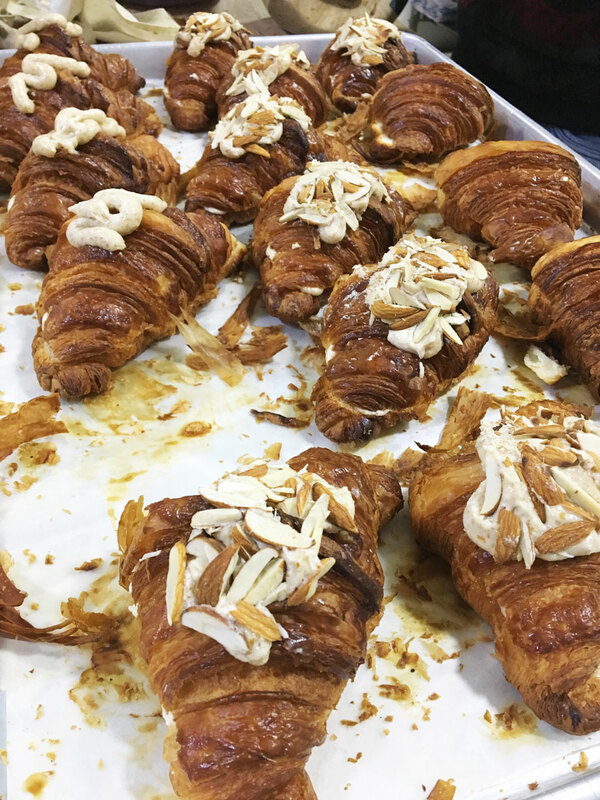 Filled with almond paste and generously topped with almonds, this is a must try. 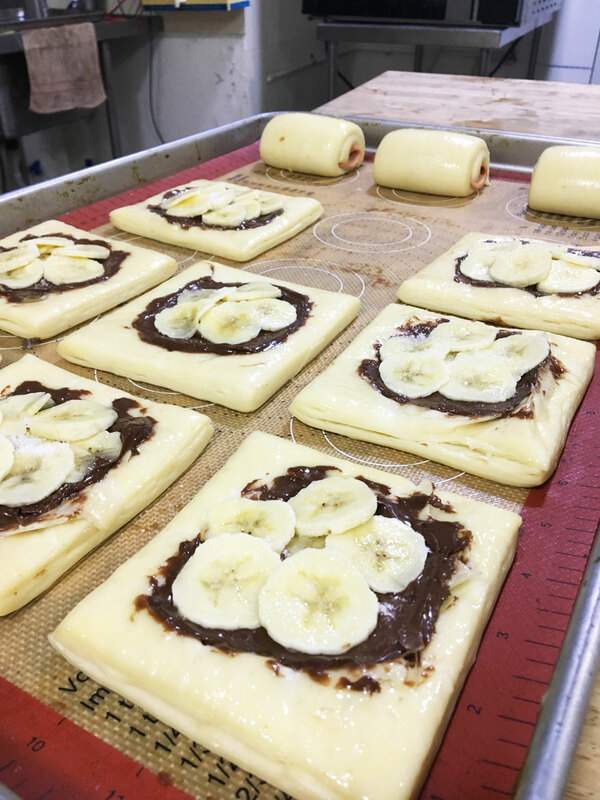 The first layer of chocolate for the chocolate and banana croisstatas. 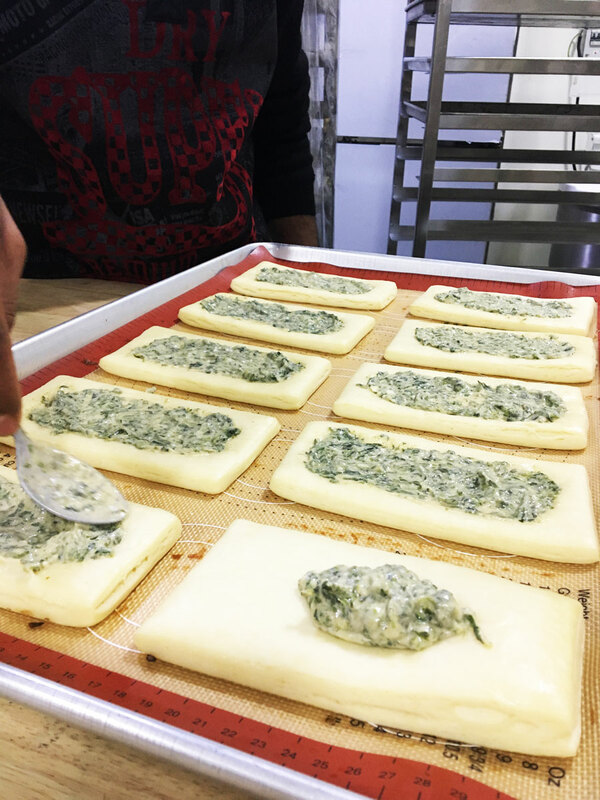 Spinach and white cheddar béchamel croisstatas ready to be baked. 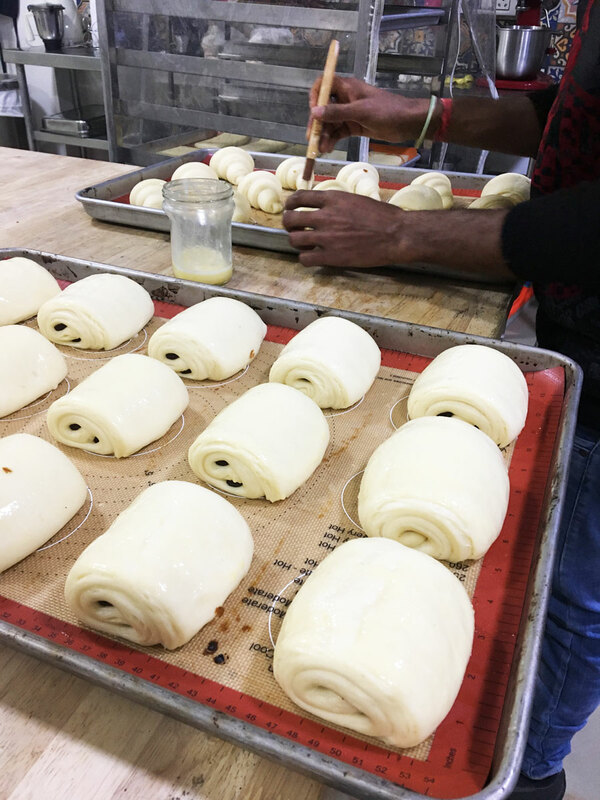 The pain au chocolat gets its final egg glaze before the bake. 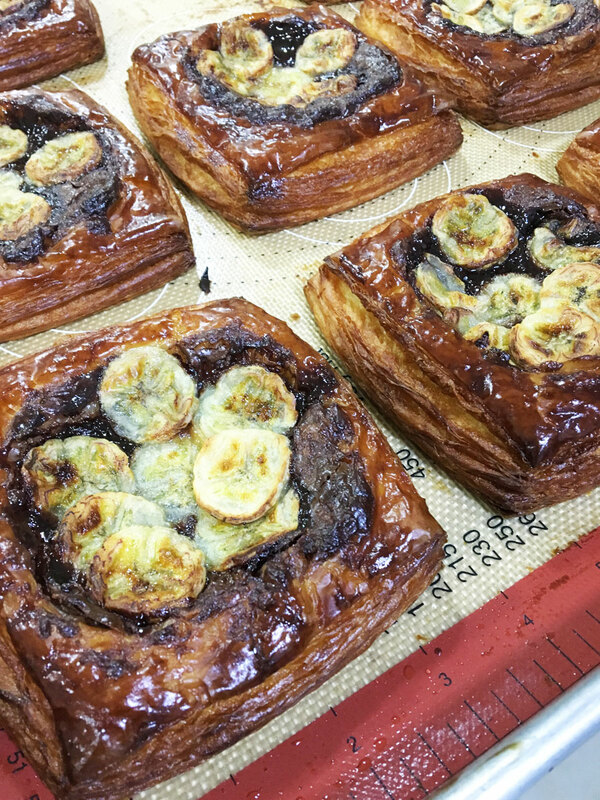 Out of the oven – voila! 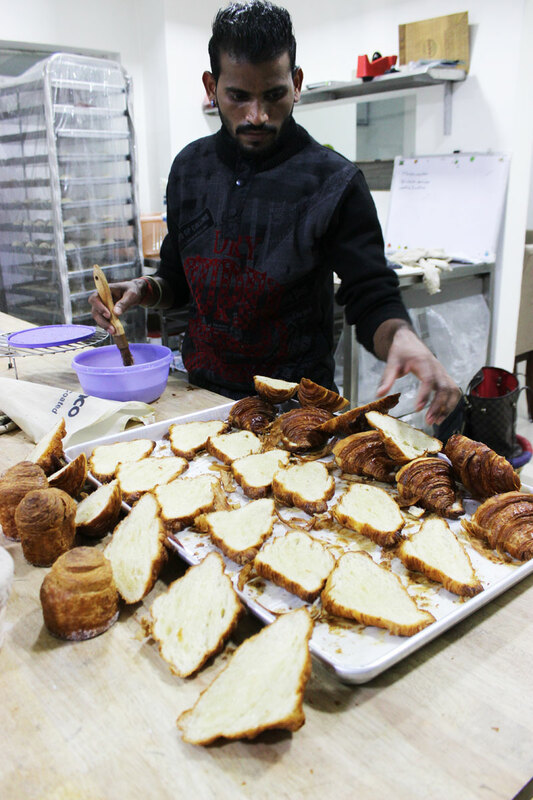 Did you always know that your passion and career would lie in baking and croissants? I was a financial analyst by profession. During my honeymoon in Europe I had French breakfasts every day, and realized that there is no similar bread or breakfast in India. 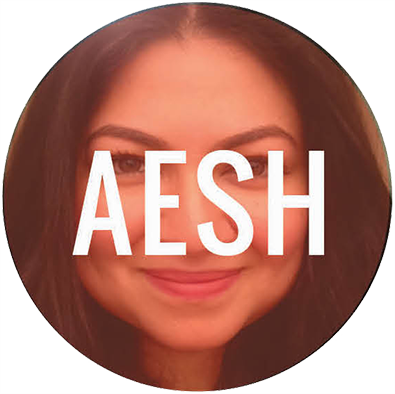 After this realization and with the support of my family, I travelled to Florida in 2017 and took apprenticeship under a bakery there. I came back home to follow this passion of delivering French bread in a real, authentic way. 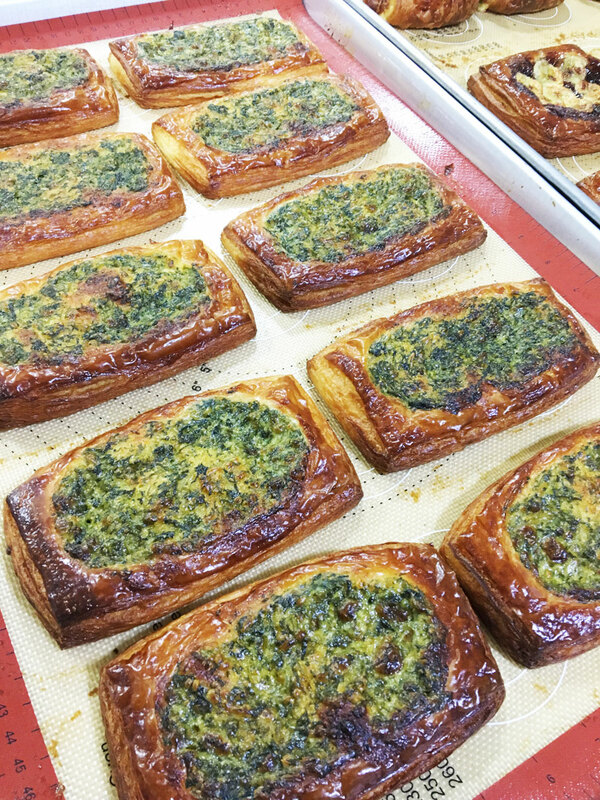 What is your favourite out of everything on the Bakehouse menu? I am very partial towards French bread, and therefore everything that I have loved in this ocean of options is available on the menu. There is nothing that I have tried and tested and not liked. 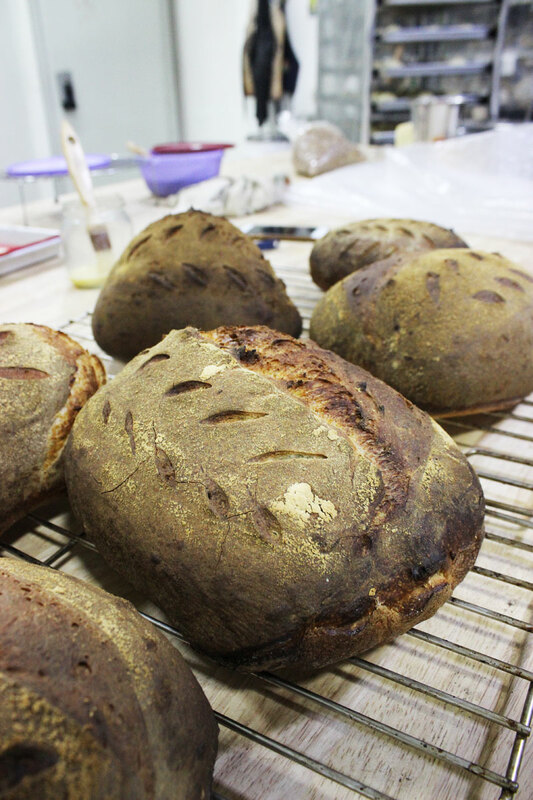 However, the sour dough bread is something I can’t keep my hands off. 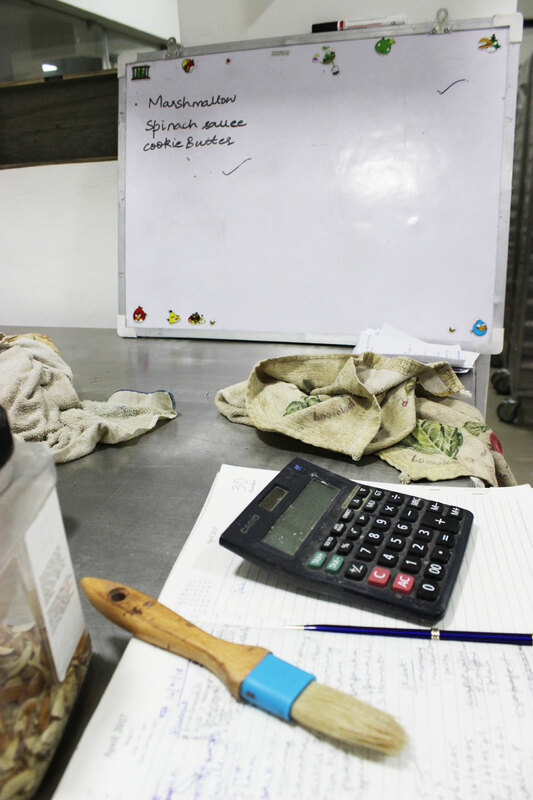 What time do you start your day and what’s an average day at Suchali’s like? I have honestly lost track of the hours I get to spend at home. 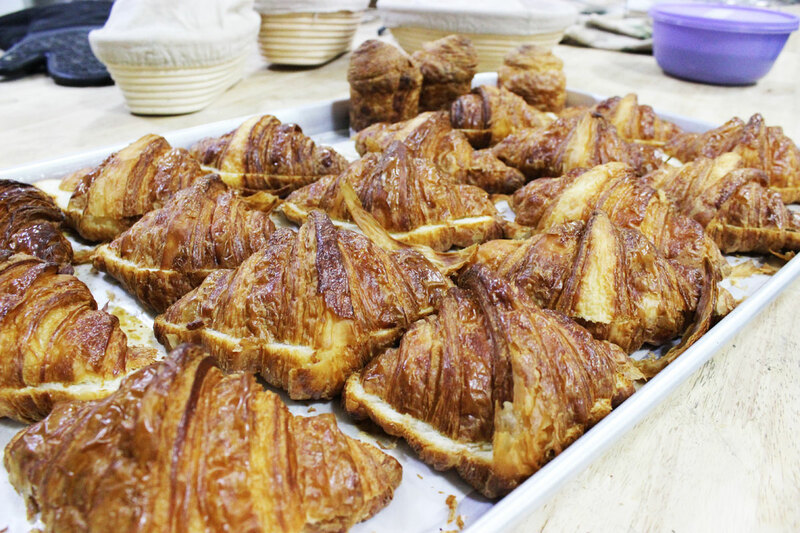 My day revolves around the kitchen because our croissants take more than a day to make. To get the perfect flakiness and buttery flavour, I need to prepare the dough in a perfectly timed manner. 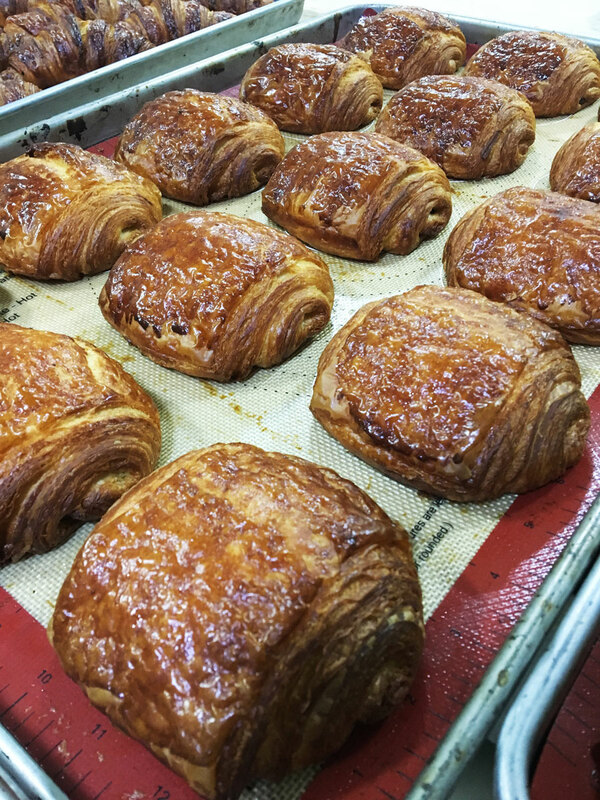 My phone has alarms going off non-stop because croissant dough needs TLC every 45 minutes! 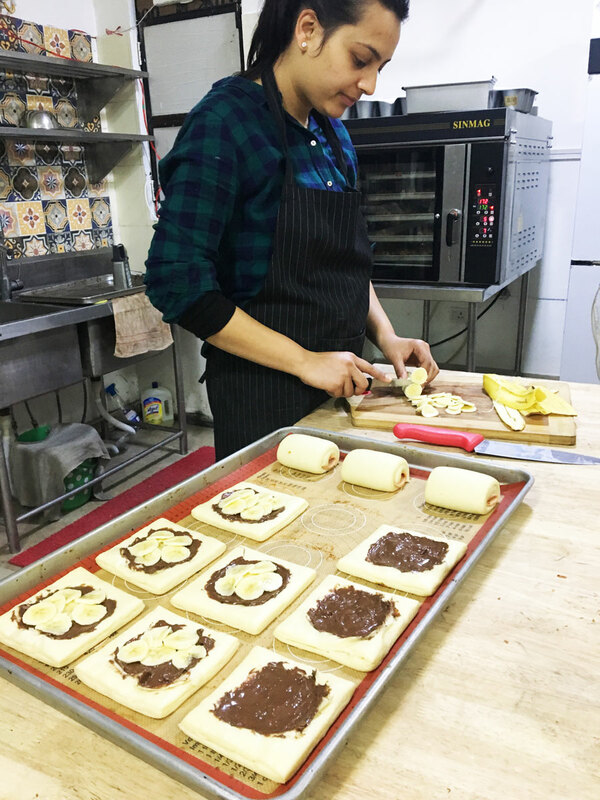 Any advice for someone wanting to get into the baking industry? Go do it! Follow your passion. However, it is not easy as it looks. To put perfect food on someone else’s plate requires dedication, physical effort and many sleepless nights. Some mornings you wake up wondering whether you’re a baker or a business house. Who would you love to bake in the kitchen with? 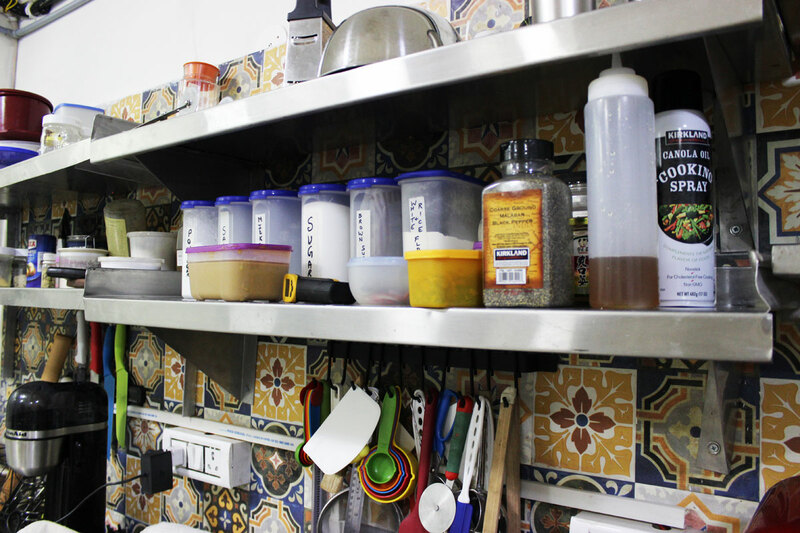 I would love to share my kitchen space and bake with Pooja Dhingra and Pablo Naranjo Agular of Le15 Patisserie and Kitchen. They are amazing and a great inspiration to me. What is the most challenging aspect of the work you do? 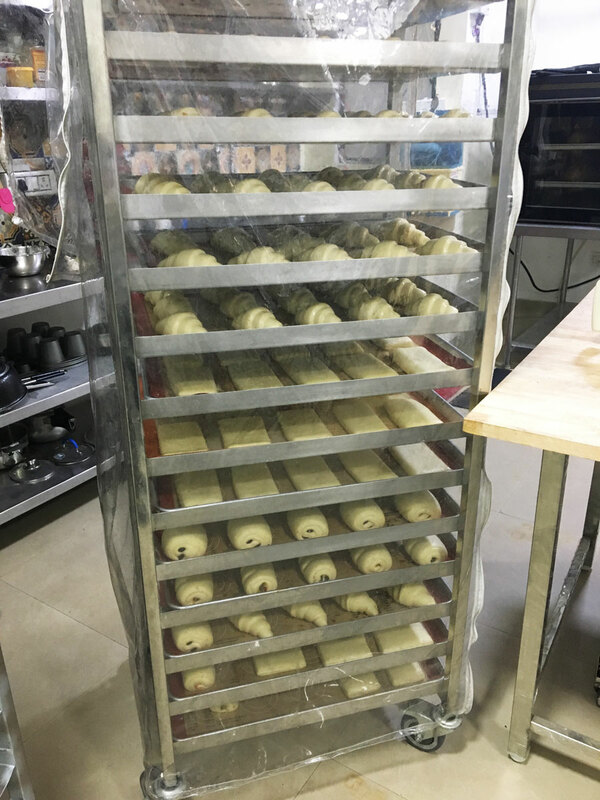 The most challenging aspect of our work is to source the right raw materials in order to produce authentic French bread. 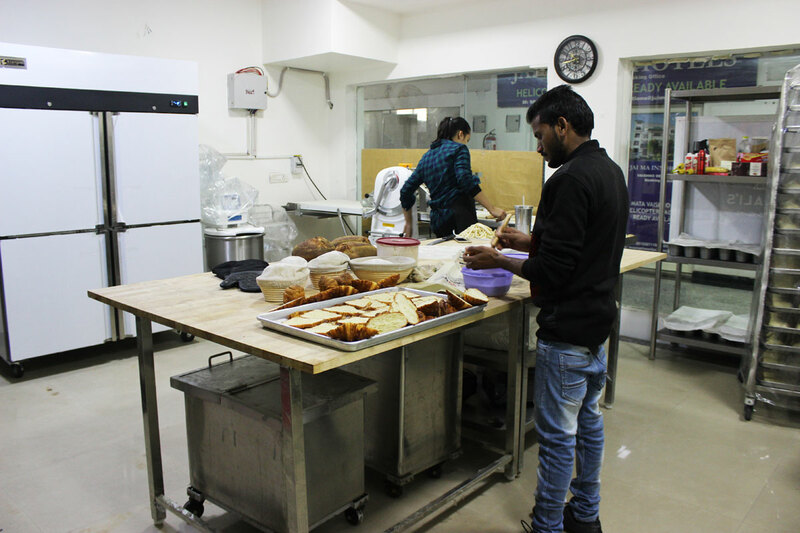 In India, it is very difficult to find the right flour containing the right protein levels required to bake such breads. Most of our time and effort is spent in sourcing. 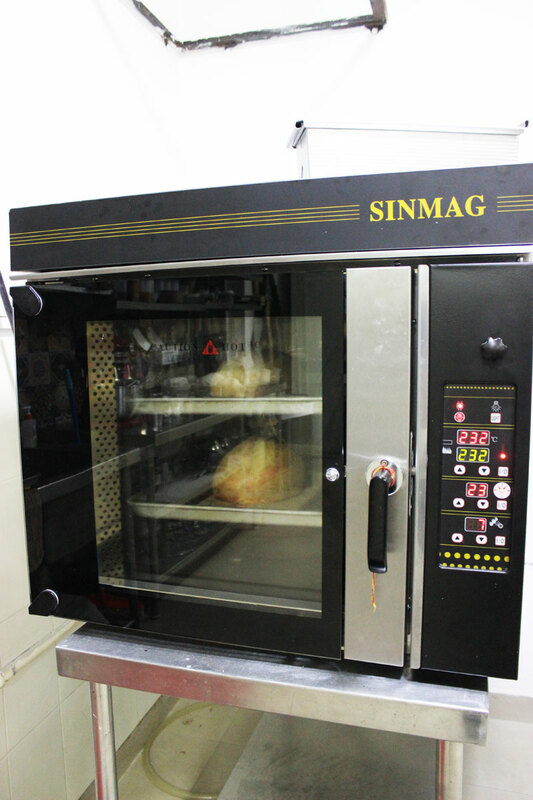 Another challenge is to cater to Indian taste buds since our product is very new and very different. We are looking forward to launching ourselves officially in the market very soon. 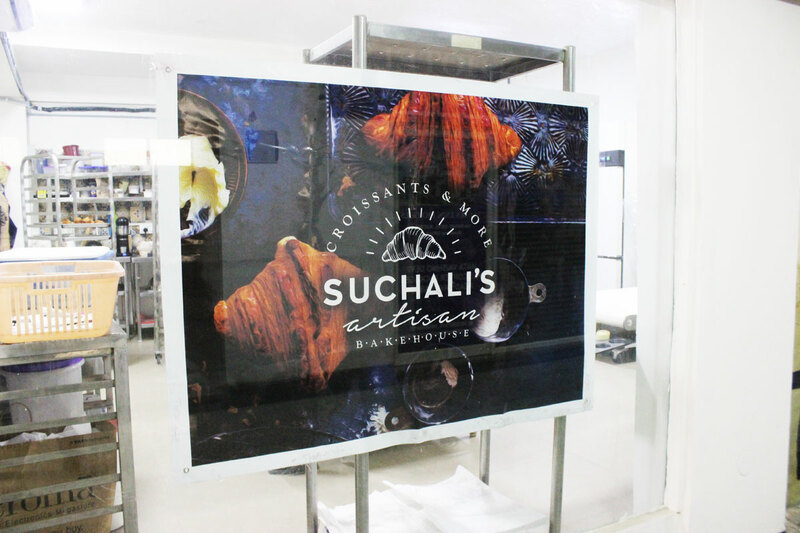 Order from Suchali’s Artisan Bakehouse at +91 7727933930 and look forward to their cart in DLF Cyber Hub from February onwards. 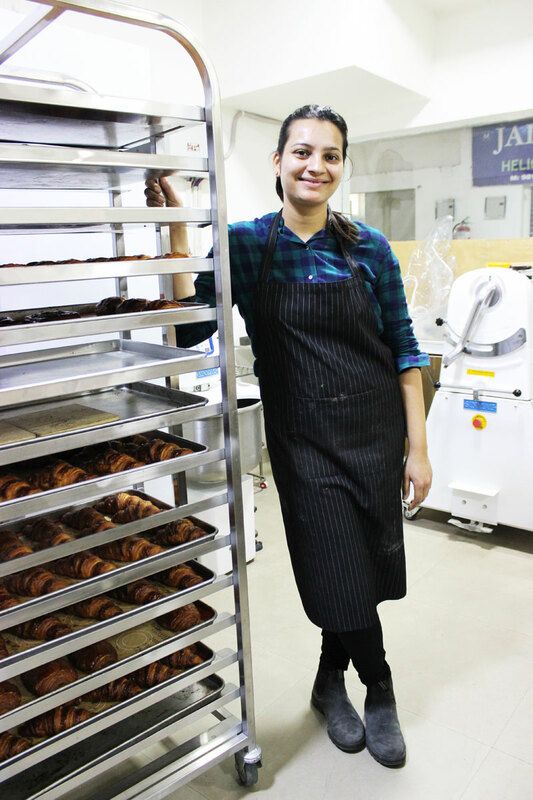 Suchali’s croissants are also available at Blue Tokai cafes in the NCR.